European Pharmacopoeia, 6th ed., 2008 and Supplements 6.1 and 6.2 (Erythromycin). It is produced by the growth of a strain of Streptomyces erythreus and is a mixture of macrolide antibiotics consisting largely of erythromycin A. It occurs as a white or slightly yellow powder or colourless or slightly yellow crystals; slightly hygroscopic. Slightly soluble in water but less soluble at higher temperatures; freely soluble in alcohol; soluble in methyl alcohol. Protect from light. The United States Pharmacopeia 31, 2008 (Erythromycin). It consists primarily of erythromycin A. A white or slightly yellow, odourless or practically odourless, crystalline powder. Soluble 1 in 1000 of water; soluble in alcohol, in chloroform, and in ether. Store in airtight containers. Pharmacopoeias in China, Europe, and US. European Pharmacopoeia, 6th ed., 2008 and Supplements 6.1 and 6.2 (Erythromycin Estolate). A white or almost white, crystalline powder. Practically insoluble in water; freely soluble in alcohol; soluble in acetone; practically insoluble in dilute hydrochloric acid. Protect from light. The United States Pharmacopeia 31, 2008 (Erythromycin Estolate). A white, odourless or practically odourless, crystalline powder. It has a potency equivalent to not less than 600 micrograms of erythromycin per mg, calculated on the anhydrous basis. Practically insoluble in water; soluble 1 in 20 of alcohol, 1 in 15 of acetone, and 1 in 10 of chloroform. Store in airtight containers. Note. Compounded preparations of erythromycin ethyl succinate may be represented by the following names: Co-erynsulfisox (PEN)—erythromycin ethyl succinate and acetyl sulfafurazole. Pharmacopoeias. In China, Europe, International, Japan, and US. European Pharmacopoeia, 6th ed., 2008 and Supplements 6.1 and 6.2 (Erythromycin Ethylsuccinate; Erythromycin Ethyl Succinate British Pharmacopoeia 2008). A white or almost white, hygroscopic crystalline powder. Practically insoluble in water; freely soluble in dehydrated alcohol, in acetone, and in methyl alcohol. Store in airtight containers. Protect from light. The United States Pharmacopeia 31, 2008 (Erythromycin Ethylsuccinate). A white or slightly yellow, odourless or practically odourless, crystalline powder. It has a potency equivalent to not less than 765 micrograms of erythromycin per mg, calculated on the anhydrous basis. Very slightly soluble in water; freely soluble in alcohol, in chloroform, and in macrogol 400. Store in airtight containers. Pharmacopoeias. In US. The United States Pharmacopeia 31, 2008 (Sterile Erythromycin Gluceptate). It is erythromycin gluceptate suitable for parenteral use. It has a potency equivalent to not less than 600 micrograms of erythromycin per mg, calculated on the anhydrous basis. pH of a 2.5% solution in water is between 6.0 and 8.0. Pharmacopoeias. In China, Europe, International, Japan, and US. European Pharmacopoeia, 6th ed., 2008 and Supplements 6.1 and 6.2 (Erythromycin Lactobionate). Salt of a product obtained by fermentation using a strain of Streptomyces erythreus. White or slightly yellow, hygroscopic powder. Soluble in water; freely soluble in dehydrated alcohol and in methyl alcohol; very slightly soluble in acetone and in dichloromethane. A 2% solution in water has apH of 6.5 to 7.5. Store in airtight containers. The United States Pharmacopeia 31, 2008 (Sterile Erythromycin Lactobionate). It has a potency equivalent to not less than 525 micrograms of erythromycin per mg, calculated on the anhydrous basis. pH of a solution in water containing the equivalent of erythromycin 5% is between 6.5 and 7.5. In Europe, International, Japan, US, and Vietnam European Pharmacopoeia, 6th ed., 2008 and Supplements 6.1 and 6.2 (Erythromycin Stearate). A mixture of the stearates of erythromycin and stearic acid. A white or almost white crystalline powder. Practically insoluble in water; soluble in acetone and in methyl alcohol. Solutions may be opalescent. The United States Pharmacopeia 31, 2008 (Erythromycin Stearate). The stearic acid salt of erythromycin with an excess of stearic acid. White or slightly yellow crystals or powder, odourless or may have a slight, earthy odour. Practically insoluble in water; soluble in alcohol, in chloroform, in ether, and in methyl alcohol. Store in airtight containers. The stability of erythromycin derivatives is dependent upon pH, with particularly rapid degradation occurring at a pH greater than 10 or less than 5.5. Incompatibility might reasonably be expected, therefore, when erythromycin preparations are mixed with drugs or preparations that have a highly acidic or alkaline pH. In practice, reports of incompatibility are not always consistent, and other factors such as the temperature and concentration of solutions, and the diluents used, may play a role. For the preparation of solutions of erythromycin lactobionate for infusion, a primary solution containing not more than 5% of erythromycin should be prepared first; only water for injection should be used in preparing the primary solution. It should be further diluted with sodium chloride 0.9% or other suitable intravenous fluid before use. Acidic solutions, such as glucose, should only be used if neutralised with sodium bicarbonate. Erythromycin and its salts and esters are generally well tolerated and serious adverse effects are rare. Gastrointestinal disturbances such as abdominal discomfort and cramp, nausea, vomiting, and diarrhoea are fairly common after both oral and parenteral use, probably because of the stimulant activity of erythromycin on the gut. Gastrointestinal effects are dose related and appear to be more common in young than in older patients. Superinfection with resistant organisms may occur and pseudomembranous colitis has been reported. Hyper sensitivity reactions appear to be uncommon, having been reported in about 0.5% of patients, and include pruritus, urticaria, and skin rash as well as occasional cases of anaphylaxis. Stevens-Johnson syndrome and toxic epidermal necrolysis have also been reported very rarely. Hypersensitivity or irritation may occur after topical application of erythromycin. A hypersensitivity reaction is thought to be responsible for the hepatotoxicity sometimes reported in patients receiving erythromycin or its derivatives but this has been disputed by some. Most reports of cholestatic hepatitis have been in patients receiving the estolate, and it has been suggested that the propionyl ester linkage is particularly associated with hepatotoxicity, but symptoms have also been reported in patients given the base and most of the other derivatives, both orally and parenterally. Symptoms indicative of cholestasis, including upper abdominal pain (sometimes very severe), nausea and vomiting, abnormal liver function values, raised serum bilirubin, and usually jaundice, may be accompanied by rash, fever, and eosinophilia. Symptoms usually occur in patients who have been taking the drug for more than 10 days, although they may develop more quickly in patients given the drug previously. Hepatic dysfunction seems to be rare in children under 12 years of age. The effects of erythromycin on the liver are generally reversible on stopping treatment. Erythromycin may interfere with tests for serum aspartate aminotransferase, which might make diagnosis of hepatotoxicity more difficult. A generally reversible sensorineural deafness, sometimes with tinnitus, has been reported in patients given erythromycin and appears to be related to serum concentration, with an increased likelihood of such effects in patients given doses of 4 g or more daily of base or its equivalent, in those given intravenous therapy, and in those with renal or hepatic impairment. Other adverse effects that have been reported in patients given erythromycin include agranulocytosis, aggravation of muscular weakness in myasthenia gravis patients, and pancreatitis. Prolongation of the QT interval and other arrhythmias, sometimes fatal, including torsade de pointes have been reported particularly with intravenous use. There have also been isolated reports of transient CNS adverse effects including confusion, hallucinations, seizures, and vertigo. Parenteral formulations of erythromycin are irritant and intravenous dosage may produce thrombophlebitis, particularly at high doses. Intramuscular injection is generally avoided as it may produce severe pain. A report of hypothermia associated with oral erythromycin in 2 children. Symptoms resolved on stopping the drug. The children were cousins, perhaps indicating a genetic predisposition to the effect. There has also been a similar report of hypothermia in 3 children given azithro-mycin orally. There have been several reports of QT prolongation or torsade de pointes associated with erythromycin, particularly with intravenous use. A review of reports of torsade de pointes received by the FDA Adverse Event Reporting System between 1987 and December 2000 identified 156 cases associated with use of the macrolides azithromycin, clarithromycin, dirithromycin, or erythromycin. Of these reports, half involved the use of other drugs known to prolong the QT interval; co-morbid diseases and physiological abnormalities, including cardiac abnormalities, were also commonly reported. A retrospective analysis of a cohort of patients who suffered sudden death from cardiac causes found that the rate of sudden cardiac death was twice as high among current users of erythromycin as in those not using antibacterials; there was no such increase among former users, nor among current users of amoxicillin. The greatest increase in risk was seen in patients using erythromycin with inhibitors of the cytochrome P450 isoenzyme subfamily C YP3A; such patients had more than 5 times the risk of sudden cardiac death of patients who took neither. Comparison in patients with upper respiratory-tract infections has suggested that erythromycin ethyl succinate may be associated with less abdominal pain than an equivalent dosage of erythromycin base. Another study has indicated that there was no significant difference in gastrointestinal symptoms between plain and enteric-coated formulations of erythromycin base. Severe nausea and vomiting after rapid intravenous infusion of erythromycin lactobionate stopped in 2 patients who transferred to oral erythromycin base or ethyl succinate. However, the adverse effects may have been due to the rate of infusion, since in 2 further patients symptoms resolved when the lactobionate was given more slowly as a more dilute solution. There have been a number of studies suggesting an association between erythromycin and infantile hypertrophic pyloric stenosis. A retrospective cohort study of 469 infants who had received erythromycin found that 43 were diagnosed with the condition including 36 male infants, although erythromycin had been prescribed almost equally for males and females. All the infants in whom stenosis developed were given erythromycin in the first 2 weeks of life. In another study, involving 7138 infants who received erythromycin between 3 and 90 days of life, use of the drug between 3 and 13 days of life was associated with an almost eightfold increased risk of infantile hypertrophic pyloric stenosis. However, it was believed that the evidence did not support a generalisation of this association to the whole class of macrolides although pyloric stenosis has been reported in breast-fed infants associated with the use of erythromycin or several other macrolides in their mothers (see under Precautions, below). For reference to the stimulant effects of erythromycin on the gastrointestinal tract, see Decreased Gastrointestinal Motility under Uses and Administration, below. For a suggestion that erythromycin or other macrolides might be associated with an increased risk of infantile hypertrophic pyloric stenosis in neonates, see under Effects on the Gastrointestinal Tract, above. Skin reactions ranging from mild eruptions to erythema multiforme, Stevens-Johnson syndrome, and toxic epidermal necrolysis have rarely been reported with macrolides. Acute pancreatitis was reported in a 12-year-old girl after ingestion of about 5 g of erythromycin base. Transient pancreatitis has also been reported in another 15-year-old girl who took 5.328 g of erythromycin base. Erythromycin produces contraction of the sphincter of Oddi resulting in reflux of bile into the pancreas but the resulting pancreatitis is self-limited and remits when sphincter tone returns to normal after the erythromycin is eliminated from the body. Erythromycin and its derivatives should be avoided in those known to be hypersensitive to it, or in those who have previously developed jaundice. All forms of erythromycin should be used with care in patients with existing liver disease or hepatic impairment, and the estolate is best avoided in such patients; liver function should be monitored. Repeated courses of the estolate or use for longer than 10 days increases the risk of hepatotoxicity. The lactobionate should be used with caution in patients with severe renal impairment; dosage reduction may be necessary particularly in those who develop toxicity. A reduced dose of the estolate has also been recommended in severe renal impairment. Erythromycin may aggravate muscle weakness in patients with myasthenia gravis. Erythromycin should be used with care in patients with a history of arrhythmias or a predisposition to QT interval prolongation. Certain medications may also increase the risk of arrhythmias (see Interactions, below). Erythromycin may interfere with some diagnostic tests including measurements of urinary catecholamines and 17-hydroxycorticosteroids. It has also been associated with falsely-elevated serum aspartate aminotrans-ferase values when measured colorimetrically, although genuine elevations of this enzyme, due to hepatotoxicity, also occur, particularly with the estolate. Erythromycin is irritant; solutions for parenteral use should be suitably diluted and given by intravenous infusion over 20 to 60 minutes to reduce the incidence of thrombophlebitis. Rapid infusion is also more likely to be associated with arrhythmias or hypotension. A milk-to-plasma ratio of 0.5 has been reported for erythromycin. However, the American Academy of Pediatrics states that, although erythromycin is concentrated in human breast milk, no adverse effects have been seen in breastfed infants whose mothers were receiving erythromycin and it is therefore usually compatible with breast feeding. 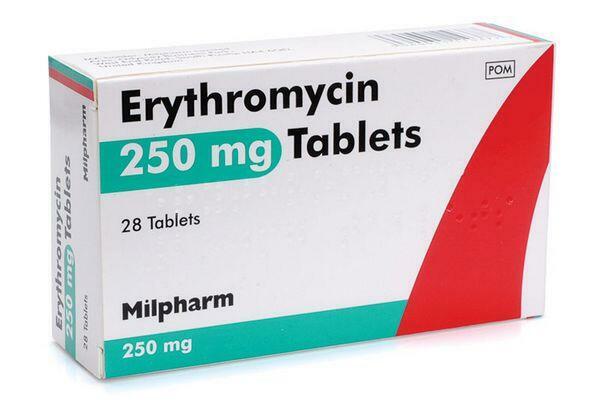 Erythromycin has been associated with acute attacks of porphyria and is considered unsafe in porphyric patients. Of 298 pregnant women who took erythromycin estolate, clindamycin, or placebo for 3 weeks or longer, about 14, 4, and 3% respectively had abnormally high serum aspartate aminotransferase values. Erythromycin estolate should probably not be given to pregnant women. A study of data from the Swedish Medical Birth Registry of infants born between July 1995 and December 2002 has examined details of infants exposed to erythromycin or phenoxymethyl-penicillin during early pregnancy. Of 1844 exposed to erythromycin, 103 (5.6%) had congenital malformations compared with 420 of 9110 (4.7%) for phenoxymethylpemcillm. Of these, 34 (1.8%) and 86 (0.9%) respectively had a cardiovascular malformation, the rate being considered high for erythromycin. This contrasted with a previous study based on a 1980-96 dataset of the Hungarian Case-Control Surveillance of Congenital Abnormalities which found no signs of teratogenicity for erythromycin. Although an increased risk for cardiovascular abnormalities was initially apparent when analysing erythromycin usage throughout pregnancy as reported by the mother, this was not confirmed when assessing usage only in the second or third month nor in the entire pregnancy for medically documented intake. The Swedish data also revealed a possible association between infant pyloric stenosis and early prenatal exposure to erythromycin although others had previously failed to confirm such a risk (see also Effects on the Gastrointestinal Tract, above). Erythromycin and other macrolides have the potential to interact with a large number of drugs through their action on hepatic cytochrome P450 isoenzymes, particularly CYP1A2 and CYP3A4. Macrolides inhibit drug metabolism by microsomal cytochromes by competitive inhibition and by the formation of inactive complexes. Such interactions can result in severe adverse effects, including ventricular arrhythmias with astemizole, cisapride, and terfenadine. Enzyme inhibition is reported to be particularly pronounced with macrolides such as erythromycin and troleandomycin. Other macrolides such as azithromycin and dirithro-mycin are reported to have little or no effect on hepatic cytochromes, and consequently may produce fewer interactions (see also Mechanism, below). Macrolides themselves have been reported rarely to prolong the QT interval and should be used with caution with other drugs known to also have this effect. Other mechanisms by which macrolides cause interactions include suppression of the gastrointestinal flora responsible for the intraluminal metabolism of digoxin and possibly oral contraceptives, and the stimulant effect of macrolides on gastrointestinal motility which is believed to be responsible for the interaction between spiramycin and levodopa. An alternative mechanism by which macrolides increase serum concentrations of digoxin is thought to be via the inhibition of intestinal or renal P-glycoprotein transport of digoxin. Few drugs are reported to affect erythromycin but ci-metidine may increase and theophylline may decrease erythromycin concentrations (see below). The effect on antimicrobial action when erythromycin is given with other antimicrobials is discussed under Antimicrobial Action, below. In rats and humans, troleandomycin, and erythromycin and some of its derivatives, induce microsomal enzymes; the nitrosoalkane metabolites so formed produce stable inactive complexes with the iron of cytochrome P450. Eventually the oxidative metabolism of other drugs may be decreased. These effects are marked after troleandomycin, moderate after erythromycin, small after oleandomycin, and absent or negligible after josamycin, midecamycin, or spiramycin. In the case of astemizole, cisapride, and terfenadine the UK CSM has warned that there is a risk of inducing ventricular arrhythmias if erythromycin, or possibly other macrolides, are also given, and that, in particular, cisapride should not be used with macrolides. The Commission on Human Medicines (formerly CSM) later advised that amisulpride, ergotamine, dihydroergotamine, mizolastine, pimozide, simvastatin, and tolterodine should not be given with erythromycin. A warning was also issued that increased erythromycin concentrations may occur when used with other inhibitors of the cytochrome P450 C YP3A isoenzymes such as the azole antifungals, some calcium-channel blockers including diltiazem and verapamil, and HIV-protease inhibitors. For a report of an increased risk of sudden cardiac death associated with such combinations see Effects on the Cardiovascular System, above. Cimetidine may increase plasma concentrations of erythromycin and deafness occurred in a patient taking both drugs. Intravenous theophylline has been reported to decrease serum concentrations of oral erythromycin although other studies using intravenous or oral theophylline with intravenous erythromycin did not show any significant pharmacokinetic changes. For reference to the effects of erythromycin on theophylline, see Macrolides, under Interactions of Theophylline. Erythromycin is a macrolide antibacterial with a broad and essentially bacteriostatic action against many Gram-positive and to a lesser extent some Gram-negative bacteria, as well as other organisms including some Mycoplasma spp., Chlamydiaceae, Rickettsia spp., and spirochaetes. Erythromycin and other mac-rolides bind reversibly to the 50S subunit of the ribosome, resulting in blockage of the transpeptidation or translocation reactions, inhibition of protein synthesis, and hence inhibition of cell growth. Its action is mainly bacteriostatic, but high concentrations are slowly bactericidal against the more sensitive strains. Because macrolides penetrate readily into white blood cells and macrophages there has been some interest in their potential synergy with host defence mechanisms in vivo. The actions of erythromycin are increased atmoderately alkaline pH (up to about 8.5), particularly in Gram-negative species, probably because of the improved cellular penetration of the nonionised form of the drug. Erythromycin has a broad spectrum of activity. The following pathogenic organisms are usually sensitive to erythromycin (but see also Resistance, below). Gram-positive cocci, particularly streptococci such as Streptococcus pneumoniae and Streptococcus pyogenes are sensitive. However, resistance has been increasingly reported in both organisms, particularly in penicillin-resistant Streptococcus pneumoniae. Most strains of Staphylococcus au-reus remain susceptible, although resistance can emerge rapidly, and some enterococcal strains are also susceptible. Many other Gram-positive organisms respond to erythromycin, including Bacillus anthracis, Corynebacterium diphtheriae, Erysipelothrix rhusiopathiae, and Listeria monocytogenes. Anaerobic Clostridium spp. are also usually susceptible, as is Propionibacterium acnes. Nocardia spp. vary in their susceptibility. Gram-negative cocci including Neisseria meningitidis and N. gonorrhoeae, and Moraxella catarrhalis (Branhamella catarrhalis) are usually sensitive. Other Gram-negative organisms vary in their susceptibility, but Bordetella spp., some Brucella strains, and Flavobacterium and Legionella spp. are usually susceptible. Haemophilus ducreyi is reportedly susceptible, but H. influenzae is somewhat less so. The Entero-bacteriaceae are usually resistant, although some strains may respond at alkaline pH. Helicobacter pylori and most strains of Campylobacter jejuni are sensitive (about 1% of the latter are reported to be resistant in the USA). Among the Gram-negative anaerobes most strains of Bacteroides fragilis and many Fusobacterium strains are resistant. Other organisms usually sensitive to erythromycin include Actinomyces, Chlamydiaceae, rickettsias, spiro-chaetes such as Treponema pallidum and Borrelia burgdorferi, some mycoplasmas (notably Mycoplasma pneumoniae), and some of the opportunistic mycobacteria: Mycobacterium scrofulaceum and M. kansasii are usually susceptible, but M. intracellulare is often resistant and M. fortuitum usually so. Fungi, yeasts, and viruses are not susceptible to erythromycin. As with other bacteriostatic antimicrobials, the possibility of an antagonistic effect if erythromycin is given with a bactericide exists, and some antagonism has been shown in vitro between erythromycin and various penicillins and cephalosporins or gentamicin. However, in practice the results of such concurrentuse are complex, and depend on the organism; in some cases synergy has been seen. For example, in the UK, the BNF recommends the use of amoxicillin with erythromycin or another macrolide such as azithromycin or clarithromycin for the treatment of uncomplicated community-acquired pneumonia if atypical organisms are suspected. Because of the adjacency of their binding sites on the ribosome, erythromycin may competitively inhibit the effects of chloramphenicol or lincosamides such as clindamycin or lincomycin. Resistance. Several mechanisms of acquired resistance to erythromycin have been reported of which the most common is a plasmid-mediated ability to methylate ribosomal RNA, resulting in decreased binding of the antimicrobial drug. This can result in cross-resistance between erythromycin, other macrolides, lincosamides, and streptogramin B, because they share a common binding site on the ribosome and this pattern of resistance is referred to as the MLSB phenotype. It is seen in staphylococci, and to a somewhat lesser extent in streptococci, as well as in a variety of other species including B. fragilis, Clostridium perfringens, Corynebacterium diphtheriae, and Listeria and Legionella spp. Decreased binding of antimicrobial to the ribosome may also occur as a result of a chromosomal mutation, resulting in an alteration of the ribosomal proteins in the 50S subunit, which conveys one-step high-level erythromycin resistance. This form of resistance has been found in some strains of Streptococcus pneumoniae, H. pylori, M. pneumoniae, Escherichia coli, Str. pyogenes, Staph. aureus, and Campylobacter spp. Other forms of erythromycin resistance may be due to the production of a plasmid-determined erythromycin esterase that can inactivate the drug, or to decreased drug penetration. The latter may be partly responsible for the intrinsic resistance of Gram-negative bacteria like the Enterobacteriaceae, but has also been shown to be acquired as a plasmid-mediated determinant in some organisms; production of a protein which increases drug efflux from the cell is thought to explain the M phenotype resistance, in which organisms are resistant to 14-and 15-carbon ring macrolides, but retain sensitivity to 16-carbon ring macrolides, lincosamides, and streptogramins. The incidence of resistance varies greatly with the area and the organism concerned and, although the emergence of resistance is rarely a problem in the short-term treatment of infection, it is quite common in conditions requiring prolonged treatment such as endocarditis due to Staph. aureus. The incidence of resistance in streptococci is generally lower than in Staph. aureus but shows geographical variation and may be increasing in some countries, including the UK. In addition, localised outbreaks of resistant strains may occur and produce a much higher incidence of resistance. A meta-analysis found that reported macrolide resistance in Streptococcus pneumoniae varied greatly from country to country. The percentage of erythromycin-resistant Streptococcus pneumoniae in the USA (20.7%) was less than that in Europe (32.0%) although this difference was not considered statistically significant, and higher levels of resistance were found in Asia (57.3%o). In Europe, Streptococcus pyogenes showed greater resistance to erythromycin (36.8%) than Streptococcus pneumoniae. However, across all regions, the mean resistance of Streptococcus pneumoniae was statistically equivalent (30.4%) and also similar to that of Streptococcus pyogenes (30.0%). Erythromycin base is unstable in gastric acid, and absorption is therefore variable and unreliable. Consequently, the base is usually given in film- or enteric-coated preparations, or one of the more acid-stable salts or esters is used. Food may reduce absorption of the base or the stearate, although this depends to some extent on the formulation; the esters are generally more reliably and quickly absorbed and their absorption is little affected by food, so that the timing of doses in relation to food intake is unimportant. Peak plasma concentrations generally occur between 1 and 4 hours after a dose and have been reported to range from about 0.3 to 1.0 micrograms/mL after 250 mg of erythromycin base, and from 0.3 to 1.9 micrograms/mL after 500 mg. Similar concentrations have been seen after equivalent doses of the stearate. Somewhat higher peak concentrations may be achieved on repeated use 4 times daily. Higher total concentrations are achieved after oral doses of the es-tolate or ethyl succinate, but only about 20 to 30% of estolate or 55% of ethyl succinate is present as the active base, the rest being present as the inactive ester (in the case of the estolate as the propionate). Peak concentrations of about 500 nanograms/mL of erythromycin base have been reported after 250 mg of the estolate or 500 mg of the ethyl succinate. A peak of 3 to 4 micrograms/mL can be achieved after 200 mg of gluceptate or lactobionate intravenously. Erythromycin is widely distributed throughout body tissues and fluids, although it does not cross the blood-brain barrier well and concentrations in CSF are low. Relatively high concentrations are found in the liver and spleen, and some is taken up into polymorphonu-clear lymphocytes and macrophages. Around 70 to 75% of the base is protein bound, but after doses as the estolate the propionate ester is stated to be about 95% protein bound. Erythromycin crosses the placenta: fetal plasma concentrations are variously stated to be 5 to 20% of those in the mother. It is distributed into breast milk. Erythromycin is excreted in high concentrations in the bile and undergoes intestinal reabsorption. About 2 to 5% of an oral dose is excreted unchanged in the urine and as much as 12 to 15% of an intravenous dose may be excreted unchanged by the urinary route. Erythromycin is partly metabolised in the liver by the cytochrome P450 isoenzyme CYP3A4 via N-demethylation to inactive, unidentified metabolites. The half-life of erythromycin is usually reported to be about 1.5 to 2.5 hours, although this may be slightly longer in patients with renal impairment and has been reported to be between 4 to 7 hours in severe impairment. Erythromycin is not removed by haemodialysis or peritoneal dialysis. Erythromycin is a macrolide antibacterial with a wide spectrum of activity, that has been used in the treatment of a wide range of infections caused by susceptible organisms. Its uses have included the treatment of severe campylobacter enteritis, chancroid, diphtheria, legionnaires’ disease and other Legionella infections, neonatal conjunctivitis, pertussis, respiratory-tract infections including bronchitis, pneumonia (mycoplasmal and other atypical pneumonias as well as streptococcal), and sinusitis, and trench fever, and, combined with neomycin, for the prophylaxis of surgical infection in patients undergoing bowel surgery. It may be used as part of a multi-drug regimen for the treatment of inhalation and gastrointestinal anthrax. It is also used in the prevention of diphtheria in non-immune patients and of pertussis in non- or partially immune patients. Erythromycin is used as an alternative to penicillin in penicillin-allergic patients with various conditions including actinomycosis, leptospirosis, listeriosis, mouth infections, otitis media (usually with a sulfonamide such as sulfaflirazole), pelvic inflammatory disease caused by Neisseria gonorrhoeae, pharyngitis, and sta-phylococcal and streptococcal skin infections. It has been used in the treatment of penicillin-allergic patients with syphilis, but there are doubts about its efficacy. It is also used in the prevention of perinatal or Group A streptococcal infections, rheumatic fever, and infections in splenectomised patients. In penicillin-allergic patients in the early stages of Lyme disease, erythromycin may be used as an alternative to a tetracycline; this use is generally restricted to pregnant women and young children, since it is less effective than other drugs. It is also used as an alternative to the tetracyclines in patients with cholera, Chlamydia or Chlamydophila infections (such as epididymitis, lymphogranuloma venereum, nongonococcal urethritis, pneumonia, psittacosis, and trachoma), Q fever, and spotted fevers. For details of these infections and their treatment, see under Choice of Antibacterial. Both oral and topical erythromycin may be used in acne (see Skin Disorders, below) androsacea. Administration and dosage. Erythromycin maybe given as the base or its salts or esters; doses are expressed in terms of the base. The usual oral adult dose is the equivalent of erythromycin 1 to 2 g daily in 2 to 4 divided doses; for severe infections this may be increased to up to 4 g daily in divided doses. Daily doses higher than 1 g should be given in more than 2 divided doses. For the prevention of streptococcal infections in patients with evidence of rheumatic fever or heart disease, who are unable to take penicillin or sulfonamides, a dose of 250 mg twice daily may be given. For the management of acne, maintenance doses as low as 250 mg daily have been used but resistant strains of propionibacteria are widespread; the BNF recommends a dose of 500 mg twice daily. In patients who are unable to take erythromycin orally and in those who are severely ill, in whom it is necessary to attain an immediate high blood concentration, erythromycin may be given intravenously as the lactobionate, in doses equivalent to those given orally. The gluceptate has also been used intravenously. To reduce the risk of venous irritation it should be given only by continuous or intermittent intravenous infusion of a solution containing not more than 0.5% of erythromycin. Intermittent infusions should be given every 6 hours over 20 to 60 minutes. Doses may need to be limited in patients with renal impairment (see below). For details of doses in children, including infants and adolescents, see below. Erythromycin was formerly given by intramuscular injection, but such injections are painful and are no longer generally recommended. Erythromycin is used as a 0.5% eye ointment for the treatment of superficial ocular infections, including neonatal conjunctivitis, caused by susceptible strains of bacteria and for the prophylaxis of neonatal conjunctivitis caused by N. gonorrhoeae or C. trachomatis. It may also be applied topically as a 2 to 4% gel or solution for the treatment of acne vulgaris and is also available in combination preparations with benzoyl peroxide, ichthammol, isotretinoin, tretinoin, and zinc acetate. Propionyl erythromycin mercaptosuccinate has also been used. Erythromycin thiocyanate and erythromycin phosphate are used in veterinary medicine. A discussion of the significance of different formulations and salts used for oral preparations of erythromycin concluded that there was no clear evidence that any was superior in terms of clinical effect. The usual dose for infants and children is the equivalent of about 30 to 50 mg/kg of erythromycin daily in 2 to 4 divided doses although it may be doubled in severe infections. Based on age, the usual dose in children 2 to 8 years old is 1 g daily and in infants and children up to 2 years old 500 mg daily. Those over 8 years of age may be given the usual adult dose (see above). For the prevention of streptococcal infections in children with evidence of rheumatic fever or heart disease, who are unable to take penicillin or sulfonamides, a dose of 250 mg twice daily may be given. The BNFC suggests a dose of 125 mg twice daily in those aged 1 month to 2 years. In addition, similar doses have been suggested for prophylaxis against pneumococcal infections. For the management of acne, maintenance doses as low as 250 mg daily have been used but resistant strains of propionibacteria are widespread; the BNFC recommends a dose of 500 mg twice daily in those over 12 years of age. It also suggests a dose of 250 mg daily in 1 or 2 divided doses for infants with acne. Although unlicensed in the UK for use in gastrointestinal stasis, the BNFC suggests a dose of 3 mg/kg given 4 times daily for infants and children up to 18 years of age (see also below). A maximum dose of erythromycin 1.5 g daily has been suggested by the BNF for adult patients with severe renal impairment. Erythromycin stimulates gut motility, apparently by acting as a motilin receptor agonist, although it has been suggested that it may have other actions as well. It has been tried, with some success, for its prokinetic action in a small number of patients with decreased gastrointestinal motility including those with functional dyspepsia, gastroparesis, reflux ileus, acute colonic pseudo-obstruction (Ogilvie’s syndrome), delayed gastric emptying after pancreatic-duodenal surgery, and neonatal postoperative intestinal dy smotility. It has also been used to increase gastrointestinal motility in critically ill, mechanically ventilated patients and in preterm very low birth-weight infants. However, the prophylactic or routine use of erythromycin in such circumstances has been cautioned against, and a systematic review of neonatal use also suggested that erythromycin should be reserved for a very small subset of high-risk preterm neonates with persistent or severe feed intolerance. Adverse effects associated with the long-term use of erythromycin that is necessary in, for example, diabetic gastroparesis, may also be problematic. For suggested doses in the treatment of children with gastrointestinal stasis, see Administration in Children, above. As well as their established antibacterial effect, it has been suggested that the 14-membered ring macrolides (such as clarithromycin, erythromycin, and roxithromycin) and the 15-membered ring macrolides (such as azithromycin) also have immunomodulatory and anti-inflammatory effects that could be useful in the management of respiratory diseases including asthma, chronic obstructive pulmonary disease, cystic fibrosis, diffuse panbronchiolitis, and sinusitis. However, a systematic review found insufficient evidence to support or refute the use of macrolides in chronic asthma although some clinical data indicated a positive effect; routine use was not recommended and further trials were warranted. A systematic review on the use of macrolides in cystic fibrosis found evidence of a small but significant improvement in respiratory function at 6 months with azithromycin compared with placebo; the role of other macrolides was unclear and further studies were needed. A randomised, double-blind, placebo-controlled study to evaluate the use of oral azithromycin given three times a week for 12 months for the treatment of cystic fibrosis in children, reported a significant reduction in the number of pulmonary exacerbations needing treatment with antibacterials, even in the absence of infection with Pseudomonas aeruginosa. Azithromycin has also been investigated in the management of bronchiolitis obliterans in patients who have undergone lung transplantation, although its role has yet to be defined. ACNE. 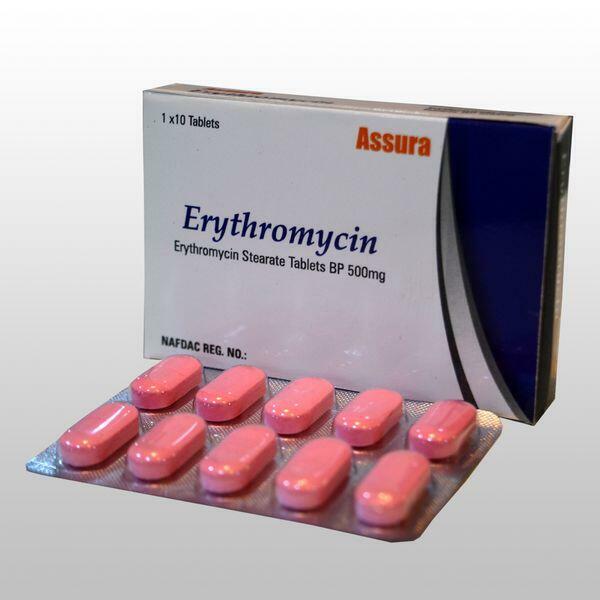 Erythromycin may be used topically or orally in the treatment of acne. Topical erythromycin may be used for mild inflammatory acne if benzoyl peroxide is ineffective or poorly tolerated. It is also used as adjunctive treatment in more severe acne. Erythromycin is also available as a complex with zinc acetate that has been reported to be more effective than topical erythromycin alone or oral minocycline. However, development of antibiotic resistance by the skin flora is an increasing problem. Combination therapy with benzoyl peroxide and erythromycin has been reported to be helpful in preventing the selection of antibiotic-resistant mutants and to be more effective than topical clindamycin alone. Alternatively, short intervening courses of benzoyl peroxide during antibacterial therapy may help to eliminate any resistant bacteria that have been selected. It has also been recommended that courses of topical antibiotics be continued for no longer than necessary (although treatment should be used for at least 6 months), that the same drug be used if further treatment is required, and that treatment with different oral and topical antibiotics or antibiotic rotation be avoided. Oral erythromycin may be used as an alternative to a tetracycline in moderate acne. However, resistance to erythromycin is increasing so it may be best reserved for those patients in whom other antibacterials are unsuitable. British Pharmacopoeia 2008: Erythrornycin and Zinc Acetate Lotion; Erythromycin Estolate Capsules; Erythromycin Ethyl Succinate Oral Suspension; Erythromycin Ethyl Succinate Tablets; Erythromycin Lactobionate Intravenous Infusion; Erythromycin Stearate Tablets; Gastro-resistant Erythromycin Tablets; The United States Pharmacopeia 31, 2008: Erythromycin and Benzoyl Peroxide Topical Gel; Erythromycin Delayedre lease Capsules; Erythromycin Delayedre lease Tablets; Erythromycin Estolate and Sulfisoxazole Acetyl Oral Suspension; Erythromycin Estolate Capsules; Erythromycin Estolate for Oral Suspension; Erythromycin Estolate Oral Suspension; Erythromycin Estolate Tablets; Erythromycin Ethylsuccinate and Sulfisoxazole Acetyl for Oral Suspension; Erythromycin Ethylsuccinate for Oral Suspension; Erythromycin Ethylsuccinate Injection; Erythromycin Ethylsuccinate Oral Suspension; Erythromycin Ethylsuccinate Tablets; Erythromycin Lactobionate for Injection; Erythromycin Ointment; Erythromycin Ophthalmic Ointment; Erythromycin Pledgets; Erythromycin Stearate Tablets; Erythromycin Tablets; Erythromycin Topical Gel; Erythromycin Topical Solution; Sterile Erythromycin Ethylsuccinate; Sterile Erythromycin Gluceptate; Sterile Erythromycin Lactobionate.